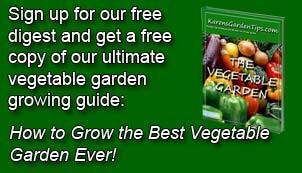 Garden beets do double duty as vegetable, providing leafy greens as well as a root crop. The root may be red, pink, orange, golden yellow, white, or white and red striped in color and globular, cylindrical or flattened. The leaves are large and heart shaped. Beta vulgaris, however, includes more than just garden beets. Sugar beets, mangel beets (grown for forage) as well as spinach beets and swiss chard (grown solely for their leaves) are also included in this genus and species. This is important to gardeners wishing to collect seed because all of these different varieties freely cross. To make matters more difficult, flowers are wind pollinated so a distance of two to five miles between different kinds of Beta vulgaris is needed to ensure pure strains. 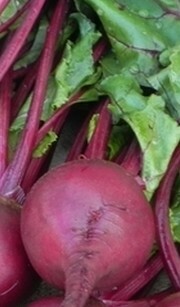 Many garden beets are hybrids and will not breed true. Plants are biennial and produce leaves and a root the first year and flowers the second. They like full sun, moderately fertile soil, consistent moisture, and pH 6.2-7. Bonemeal in the soil promotes good root development. 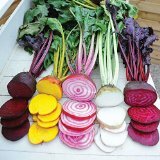 Garden beets are cold weather crops and can be planted outdoors starting a month before the last frost in the spring with subsequent plantings at one month intervals in areas with cool summers. Beets are not normally started indoors because of their early planting date outside and the fact that they do not transplant easily. The beet”seeds” in a seed package are usually a cluster of two to six seeds called a seed ball and you can expect several plants from each ball. 1. Soak in water overnight before sowing to dissolve a germination inhibitor in the seed coat and soften the coat. 2. Direct sow the seeds one to two inches apart pressing firmly and covering with 1/5 “ soil. Beets should germinate in five to twenty days if temperatures are between 50 and 85 F.
3. As the seedlings emerge thin them to three to four inches apart, cutting off the leaves at ground level (and eating them). To buy beet seeds from Amazon.com click here.